What good is a volcano? Like thousands of people around the world, my April travel plans were no match for Eyjafjallajökullo, a smallish volcano located in the far south of Iceland. I’m in Iceland now for a Balaton Group meeting and thanks to an enthusiastic soil scientist, I find myself standing in a pasture not far from Eyjafjallajökull. With its sleek, gray sides and surprisingly flat top, Eyjafjallajökull is far from the ugly, menacing volcano I expected. I’m struck by the vibrancy of this place: a herd of Icelandic horses grazes about 200 feet down the riverbed and what must be hundreds of sheep roam over the hillsides down the road. Thick vegetation covers the pasture and Icelandic birch trees line the roads. Even the soil I stand on has a bounce to it. If you had asked me “What good is a volcano?” I would have said, “not much!” So, when I learned this week that volcanoes have a silver lining (or two), I had to laugh. Even a volcano, the same one that ruined my travel plans, has a role to play in the tightly interconnected and delicately balanced phenomenon we call earth. 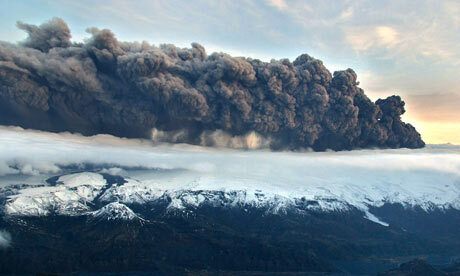 So, what good is a volcanco? Thanks to Guõrún Gísladóttir, an enthusiastic and highly knowledgeable professor of Geography at the University of Iceland, I learned one answer to this question has to do with soils. In Iceland, the soils are called andosols. Andosols are soils that are formed in the volcanic regions of the world. These soils have special properties that make them an important and unique natural resource. These soils form from tephra, the stuff blown out of volcanoes. 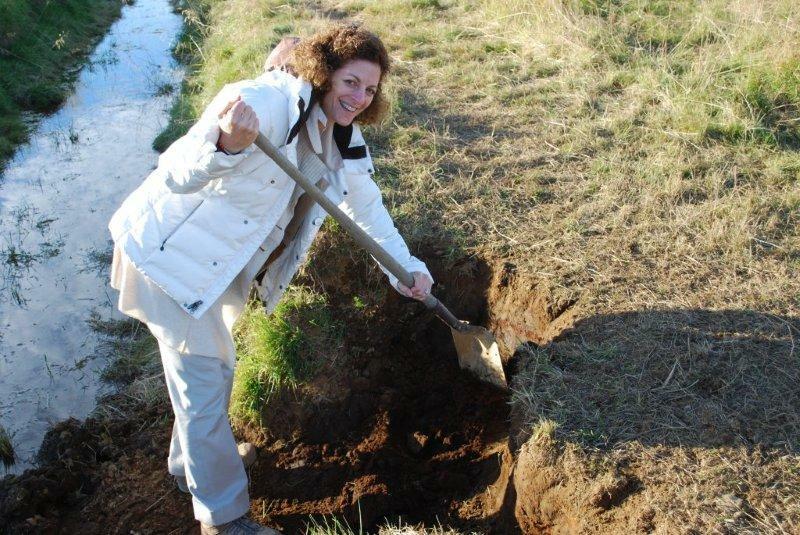 Professor Gísladóttir and I grab a few shovels and dig down four feet or so in the pasture near Eyjafjallajökullo. We find six different colored stripes in the soil, each stripe telling a different story. As I learn, tephra is filled with nutrients. If you taste it (which I did! ), it has a crunchy, earthy taste, not far from a hyper-healthy granola. With the help of the rains, the nutrients from the tephra wash into the underlying vegetation and into the soil itself. Whether your soils are fed by a volcano, or by salmon in a nearby river, or good old household compost, healthy soil provides a foundation for healthy crops, the cleanliness of water, and the livelihoods of farmers. If handled well, soils (and the millions of creatures living in our soils) also help to break down waste, turning it into food for other species. We depend on soil to live, yet it is surprisingly easy to forget. When we pave where pavement isn’t necessary, clear cut forests, over-graze land, or cultivate land without protecting the top soil, we leave our soil unprotected and vulnerable to erosion. Of course, there is much, much more for me to learn about soils. So for now, I have decided to become a student of soil, studying how to create and talk about healthy soil and prevent soil erosion. What’s my motivation? I share Dana’s desire to raise the level of public discussion about systemic issues. I also want to be able to explain to my kids how the health of our soil effects the health of people. I want them to be inspired by soil, to invest in it and to treasure it. If they have all the money in the world, but poor soil, dirty water and less wholesome food and less natural beauty, what good is that?